A radio telescope in outback Western Australia has been used to observe radiation from cosmic rays in two neighbouring galaxies, showing areas of star formation and echoes of past supernovae. The Murchison Widefield Array (MWA) telescope was able to map the Large Magellanic Cloud and Small Magellanic Cloud galaxies in unprecedented detail as they orbit around the Milky Way. 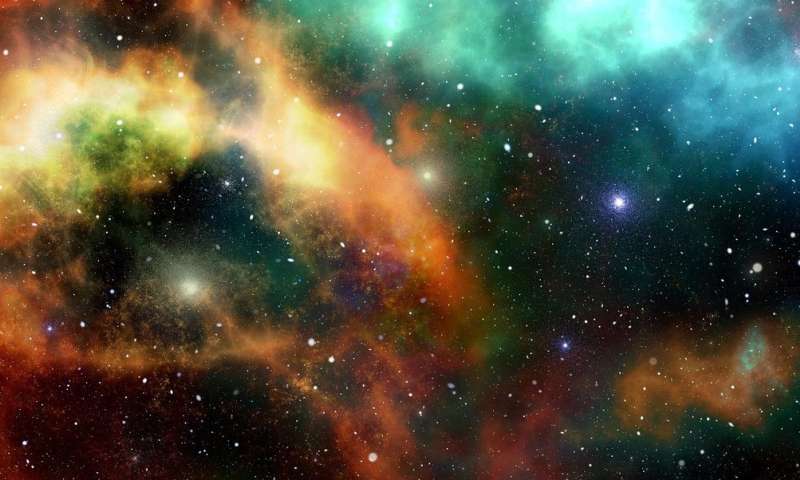 By observing the sky at very low frequencies, astronomers detected cosmic rays and hot gas in the two galaxies and identified patches where new stars are born and remnants from stellar explosions can be found. The research was published today in Monthly Notices of the Royal Astronomical Society, one of the world's leading astronomy journals. International Centre for Radio Astronomy Research (ICRAR) astrophysicist Professor Lister Staveley-Smith said cosmic rays are very energetic charged particles that interact with magnetic fields to create radiation we can see with radio telescopes. "These cosmic rays actually originate in supernova remnants—remnants from stars that exploded a long time ago," he said. "The supernova explosions they come from are related to very massive stars, much more massive than our own sun. "The number of cosmic rays that are produced depends on the rate of formation of these massive stars millions of years ago." The Large and Small Magellanic Clouds are very close to our own Milky Way—less than 200,000 light years away—and can be seen in the night sky with the naked eye. ICRAR astronomer Dr. Bi-Qing For, who led the research, said this was the first time the galaxies had been mapped in detail at such low radio frequencies. "Observing the Magellanic clouds at these very low frequencies—between 76 and 227MHz—meant we could estimate the number of new stars being formed in these galaxies," she said. "We found that the rate of star formation in the Large Magellanic Cloud is roughly equivalent to one new star the mass of our sun being produced every ten years. "In the Small Magellanic Cloud, the rate of star formation is roughly equivalent to one new star the mass of our sun every 40 years." Included in the observations are 30 Doradus, an exceptional region of star formation in the Large Magellanic Cloud that is brighter than any star formation region in the Milky Way, and Supernova 1987A, the brightest supernova since the invention of the telescope. Professor Staveley-Smith said the results are an exciting glimpse into the science that will be possible with next-generation radio telescopes. "It shows an indication of the results that we will see with the upgraded MWA, which now has twice the previous resolution," he said. Furthermore, the forthcoming Square Kilometre Array (SKA) will deliver exceptionally fine images. "With the SKA the baselines are eight times longer again, so we'll be able to do so much better," Professor Staveley-Smith said.